One of the best things about Hacienda Tres Rios Resort, Spa & Nature Park is the variety of activities, including cooking and sushi-making classes, towel art demos and Hobie Cat sailing, to name just a few. In addition, the tours in our private nature park are bonuses that can’t be found at other resorts. 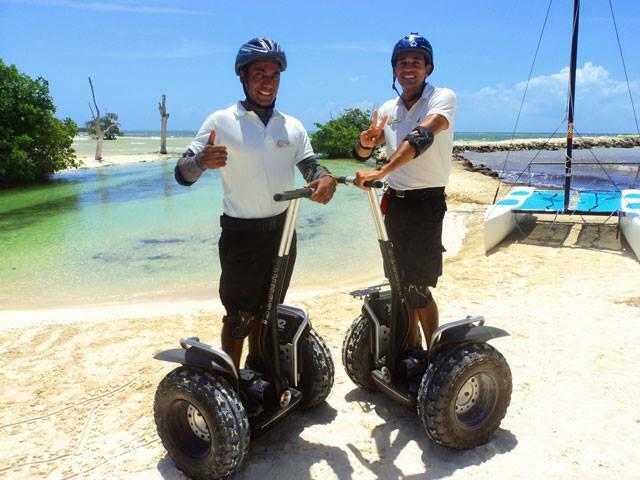 All of these activities and tours are included in our Endless Luxury all inclusive plan. However, if you are looking for an extra special experience Hacienda Tres Rios also offers the following activities at an extra cost. And they are worth every penny. The Chef’s Table is a delectable, unique experience. Enjoy a 7-course meal in an intimate setting, our kitchen. Your personal Chef explains each dish and its ingredients, while the courses are delivered at perfect intervals. The Chef’s Table will leave you relaxed and not stuffed, but satisfied. The Luna Maya Dinner is a private romantic a la carte dinner in the location of your choice, including the beach, the pool, Terraza Martini or even your room. The dinner includes an appetizer, soup, entrée, and dessert. Various entree options are available, from sea bass to rack of lamb. Explore the nature park, nursery and beach on this two-wheeled self-balancing electric vehicle with all-terrain tires. At first it’s a strange sensation, but once you get used to it the Segway feels like a part of you, a part you don’t want to let go of at the end of the tour. The Segway’s electrical engine makes it one more green option available to our guests. Ya’ax Che Spa combines modern spa technology with Mayan wisdom of the past. Our treatments combine natural ingredients with herbal baths, quartz and stones. Let us pamper you with Manicures and Pedicures, Massages, Body Treatments Facials and Special Packages that combine various spa treatments. Temazal is an ancient Maya sweat lodge, a Mayan sauna so to speak, and we have one on site. Temazcal was used as part of a curative ceremony to purify the body, for healing the sick, improving health, and for women to give birth. We are one of the few resorts that offer this traditional Mesoamerican purification and relaxation experience. See photos of our activities on Pinterest! Download our activities schedules here! View our Specials & Packages here!